This page is a collection of thoughts and notes pertaining to The Product Development Process, and particularly in getting products made. These notes are in no way definitive and are only an overview. They come as answers to questions we often receive and are in no particular order. Please let us know if you have additional questions or comments. We welcome your input. One of the hardest, yet most useful parts of the process is the definition of requirements. If you understand the goals (including governmental and customer needs) it is much easier (and cheaper) to design the product and meet them. Like going on a trip without a map, the Product Development Process relies on knowing the information within the Engineering Specification. Don’t short-cut this process. See Step 2 – Requirements for more information. Learn your market. Really, and don’t pretend. Perhaps this is a waste of electrons on your screen, because too many people think they know, when they really only know a piece. Learn your market, and be honest about it. If you have an honest feel for competitors and for the quantity of your product that will sell, it is so much easier to make decisions about design, and therefor, about manufacturing processes. Most importantly, knowing what to expect guides all your business dealings. Do your Market Research, or hire someone to do it for you. There is a whole continuum of cost, timing, design and quality trade-offs when it comes to Manufacturing. The choices are almost limitless. Decisions on processes are best guided by quantity, cost and timing. It is important to explore the various options as part of the engineering specification and design phases. As an example, if a product design is for molding, and the volumes are small (like 1000 pcs), the tooling is much different than if volume is high (100,000’s). Actually, small volumes are often more cost effective in a different manufacturing process altogether. Furthermore, it is better to change the entire design to optimize for lower quantity manufacturing methods. As potential quantities change, part costs change — along with the manufacturing process, NRE, and the speed parts are made. Time plays a huge part in the overall cost of a project. If you are on a tight time table, you will pay a premium for “instant attention” from most vendors. If the timetable extends (a little), the costs of engineering, tooling, and other things go down. The time difference from “go as fast as humanly possible” and a “just keep things moving” might be 10% or 20% (time) – but the financial cost can easily double. Weigh carefully the factors involved in timing. When time is really important, consider Time Compression Technologies. Time Compression is a buzz word in prototyping and low(er) volume manufacturing. This is really applying the technology of moving very quickly from design to parts. As an example, a typical injection mold takes 8 to 12 weeks. In time compression arenas it is drastically shorter. An example is in this image. We assist with parts where time from design to component is just 2 or 3 weeks — from start to finished injection mold parts. There are trade-offs, however, and most have to do with cost. Basically, you pay less for tooling, but more per part, and these molds can’t produce thousands of parts efficiently. There are a few different technologies that can accomplish this and all have advantages and drawbacks. It is, what it is — perfect in some situations, but impractical in others. Fabrication or CNC machining have little or no investment, but higher part cost, and volume is a limitation. By investing in fixtures, CNC programming, etc., the machining cost per part goes down significantly. If parts are Sand Cast before machining, cost goes down further, but tooling requires time and money. Die-casting requires a significant investment, but the cost per part is less — sometimes drastically. The next step adds automation. Again, up-front investment is even higher, but the cost of each part goes down as speed increases. An Important Item of Note: Design of the part is different for each of the above cases. Choosing the right process up front minimizes the time and expense of redesign for a different process. Secondly, opting for something entirely different, like converting to a stamping instead of a casting might really be the ticket. Explore your options. Obviously, the example is only an illustration of possibilities. Machining is not usually considered against fully automatic die casting, but it shows the point with respect to the cost continuum. If a lot of parts are needed, especially if they are complex, automated die casting can be effective. If only a few parts, automated die casting isn’t even a consideration. Plastic parts follow the same thinking pattern. Complexity is another factor. Generally, the more complex a product or the more complex a part, the more it will cost. Careful design, and design optimization will reduce cost. Sometimes this is simplifying parts; Or, changing parts to a simpler or less costly process; Sometimes it is eliminating parts by having other parts do multiple things. That is an area where Synthesis can really help. For small companies (and inventors) the best choice for resource use may be in starting small (with technologies and manufacturing methods of low investment) to develop and explore the market. As you discover a significant market draw for the product (real quantities), better choices for manufacturing can be made — and hopefully funded by sales of products made. Going to the right source for the right information is key in finding the elegant solution, and thereby reducing complexity, cost and timing. At Synthesis we espouse the concept of working with vendors early in the design process so their input is fully considered and incorporated. We do not claim to be experts at everything, but we know how to find the experts and we know how to bring together input from many different sources. Some people call this Concurrent Engineering, We call it “SYNTHESIS” – bringing the pieces together for a coherent whole. The manufacturing location has big effect on cost. China, for instance, has low cost manufacturing. That typically works for high volume situations, sometimes with great benefit, but there are trade-offs — many. Learn about the trade-offs before jumping in. As mentioned above, a good understanding of product requirements are the best way to save time. Just knowing what target to shoot at keeps the team from wandering around and having to “redo” the work. It also does a lot to keep the team interested and excited. Available resources (like money and expertise) play a huge part in timing. In many cases, more money can reduce the time to completion, but it has a diminishing return. All the money and all the experts in the world can’t reduce the time to zero. Time compression technologies (see above) are a great way to reduce the time moving into production. This is a great way to shorten time, but usually comes with a price of both dollars and quality. Concurrent engineering or “Synthesis” is a great way to reduce the time of a project. It also brings together more good brains which usually makes for a better overall product. This approach does not carry to extremes very well because management issues can over cloud the benefits when a team gets too big. Choices for vendors can significantly effect timing. A good vendor can bring the product home on schedule, while an over ambitious vendor can end up with all sorts of issues that consume lots of extra time. A few years ago, one of our customers found an inexpensive source for producing their plastic parts in China. The promised timing was half that of the local vendors, and the price was much less, so they went for it. It was months before the customer received “good” parts. In the meantime, they lost several months of potential sales. In the end, once they got the process up and running things went smooth. They now get cheap parts and things are OK, but in the beginning, they had to deal with several issues that seriously impacted timing (cost and frustration too). As mentioned above, there is a continuum in trade-offs for price depending on expected volumes and up-front tooling costs (NRE). (See the graphic above.) If volumes are low, simple tooling works – (which usually means higher piece price). If volumes are really high, then complex (usually very expensive) tooling (such as multi-cavity molds, progressive dies and/or automation) bangs out millions of parts at the lowest possible price – and there is a whole spectrum of technology in between. Below are some more common manufacturing techniques — very loosely described with respect to our discussion. I suggest a quick web search to learn a lot more about them. Injection Molding: This is one of the most common processes. When quantity is high, part cost is relatively low (from pennies to a few dollars). However, up-front tooling costs can be high ($10,000 – $100,000 or more) with relatively long lead times (8 – 12 weeks typical). This process is especially good for high volume production, and for complex shapes. Time compression injection molding (discussed above) can significantly reduce the tooling costs and lead time, but it’s a trade for higher part costs and limits in production quantities. Examples of products made via Injection Molding include most plastic parts you see every day. Your computer mouse, plastic cutlery, many consumer devises, toothbrushes, etc..
Blow Molding and Thermal Forming: These processes are typically very good for lower quantity and larger (size) parts. They have their place and their trade-offs; and like injection molding, they also have a spectrum of price trades. One of the biggest trade-offs is materials, because not all plastics work in these processes. Fortunately, that is getting better with time. One of the key benefits of these processes is the ability to have “closed” parts — something that can’t be done in injection molding without post processing. Another really good thing with Thermal Forming is the ability to use really inexpensive molds (for very low volumes). Even wood molds are available, though they have a shorter life. Examples of products from Blow Molding include water bottles, larger children’s toys, coolers, etc. Thermal Form part examples include blister packaging, trash cans, appliance panels, etc.. Rotational Molding: This process is typically for low quantities because of the long processing time, but it’s a great process to accomplish unique geometry not possible with other processes. Finished parts are hollow, and must meet some specific requirements, so it’s best to design for this process if you need the characteristics. Parts can range in size from small to very large. Examples of products from Rotational Molding include chemical processing linings, aircraft ducting, structural storage tanks, etc..
Extrusion: This is a fun process where near molten plastic is pushed through a hole of a particular shape to give a long piece that is the same shape all along. These long pieces are then cut to length. Compared to their size, extrusion parts are typically quite cheap, and the tooling (dies) are not too expensive either. If a part has a consistent cross-section all along, and if you need a lot of them, extruding is a good option. Examples of products from Extrusions include moldings and trims, slide rails, pipes, etc.. Automation: Although this is not a method of manufacturing, automatic operations like robotics add (for an up-front price) to any of the above processes to increase quantity and reduce per part cost. Examples of products made with Automation include almost everything with really high volume. There many other processes for plastics. These are just a few of the most common. Fabrication: This process is best described as “cut and weld” — though it is not limited to that. This is a great method for prototyping, but generally very expensive (done by hand) for making production parts. However, with the right tooling (like stamping dies and automatic welding) it yields components that perform in ways like no other process. Also, with automation, it is one of the least expensive methods of producing complex metal parts. Examples of products made via Fabrication include car body panels, bicycle frames, etc..
Machining: Usually low (or no) tooling costs, but has higher piece prices. Starting with a block of material (metal, plastic and other materials), nearly any shape is machined. Machining is great for prototypes that will eventually process some other way like casting. The addition of CNC programming and fixturing speed up the process and reduce the per part cost (for the right quantities). One big advantage for machined parts is they turn out full strength — obviously dependent on the material. Other processes like heat treatment are easily added to achieve desired properties. Examples of products made via Machining include many car parts, pieces inside appliances, tools, etc.. Stamping & Forming: As one of the fastest ways to produce large quantities of parts, stamping is extensively in many industries for parts of all sizes. The process basically cuts out, forms, bends and shapes sheet stock. There are several technologies available to meet various requirements, and costs vary depending on need. Tooling is usually quite expensive (especially for progressive dies and big parts), but piece costs are typically quite low. From a design standpoint, there are a lot of specific requirements with stamping to accomplish the result. Examples of products made via Stamping & Forming include springs, kitchen pans, many aircraft parts, etc.. Forging: Though this process does not usually make finished parts, it is used a lot to press metal to “near net shape”, then machine easily into the final components. A forge basically smashes metal into a shape. Sometimes it’s with a huge hydraulic press, and sometimes by dropping a massive weight on the die. The big advantage of forging is strength of the final parts. Tooling is typically very expensive with long lead times, yet forging is cost effective for strong parts with a complex shape — for higher quantity. Perhaps you’ve seen “Drop Forged” on your hand tools? Examples of products made via Forging include shop tools, cutlery, many aircraft and car parts, etc.. 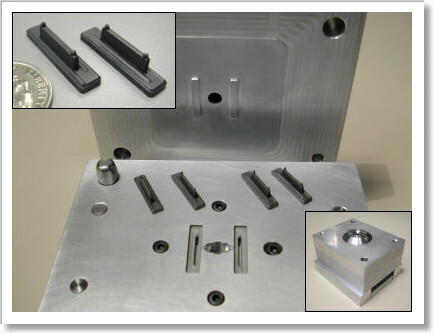 Casting: Much like injection molding for metal, this process makes complex parts fairly cheap. Variations in this process from sand casting to wax casts to die casting change the cost of tooling, and affect both lead times and part prices. This process is typically for parts of greater complexity. Examples of products made via Casting include your Barbecue cover, many car parts, some jewelry. Extrusion: Just like the process in the list above for plastics, this process works with metals too. Both tooling and parts are more expensive for metals, but still quite reasonable for the part size. Examples of products made with Extrusions include moldings and trims, tubes, banisters, etc..
Lots more: There are literally thousands of ways to bend, form, cast, machine or otherwise shape metal, and the choice of processes is entirely dependent on the individual situation, volume and especially component needs. Wood: I’ll assume most people know Wood when they see it. A variety of wood types are available and they are shaped, glued, and cut into almost any shape. Tooling is typically quite cheap, but most processing is labor intensive. This can make piece cost can be quite high — comparatively. Examples of products made via Wood include furniture, decorative accents on household items, etc.. Foam: This includes both soft and hard. Also, it is used as a filler or pad inside something else. Interestingly, the processes are much like those above for stamping, heat forming, molding, etc.. Examples of products made via Foam include cushions, vibration and noise damping, toys, etc..
3D Printing: Perhaps this method should be listed under plastics? Or not, because some methods use paper or metals. It makes a great way to create prototypes, for sure, but it is also making in-roads with production manufacturing. Examples of products made via 3D Printing include complex aircraft ducting, unique cases, trinkets, etc..
Electronics: This is mentioned simply because electronics are more and more common in everyday products. However, we’ll not go into detail for manufacturing. We have listed above some of the most common processes with respect to metal and plastic and a few others. These cover the areas where we get the most questions. There are, of course, hundreds of processes for these and other media like glass, carbon fiber (and other composites), fabric, etc.. It is not our intent to document or even start to pretend we are experts in all those fields. However, we know experts that will get us to the right point if needed. For more information about production process and how it may apply to your particular product, please give us a call. First – Don’t underestimate the value of a good plan (see Product Specification – Step 2). Second – The financial impact of going into production is typically large, so get things in order. Third – Know your business. Do the market research to know the volumes you can expect to produce. That will drive the design as well as manufacturing — ultimately driving your success. Fourth – Make sure you have some guides along the way to help you avoid potential pit falls. In our Startups Article, we call them “Sand Pits”. We Wish You Good Luck In Your Ventures!